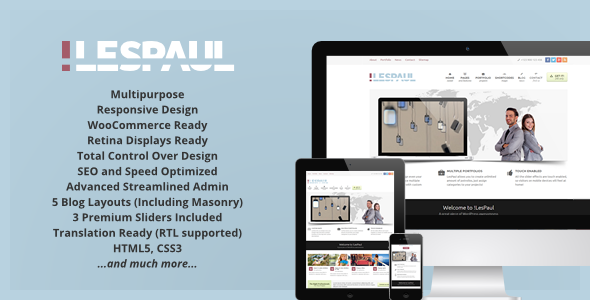 !LesPaul is multipurpose, modern, elegant, super flexible, Retina-ready responsive WordPress theme which offers great scalability to fit your needs. The theme gives you streamlined user-friendly admin interface using much less screen real estate than in any other theme � working with !LesPaul is simply pleasure. Well thought, designed and coded, the theme will respond to your content immediatelly. Built for future and using modern, SEO optimized HTML5 & CSS3! Fully Responsive design of this theme will fit your large desktop screen and all the way down through laptop, tablet screen, down to your smartphone. It looks beautiful on any device! Touch gestures are enabled for sliders and other shortcodes. Sharp Retina (high DPI) graphics will look beautiful on modern high resolution displays. The theme is just ready for future! Full WooCommerce plugin support will let you turn you website into an online shop with ease! Endless design options and customization are just a click away in beautiful, easy to use WebMan Admin Panel. Customize and brand even your WordPress administration (including custom admin dashboard welcome widget and login screen)! Localization support assures you can build multilingual websites with this theme. The theme translation is even optimized and split into several different sections to ease the job for translators. WPML plugin support is assured. Extensive documentation is included with the theme and in fact built right into WordPress contextual help � so just a click away. You can check out even an online version of theme�s user manual full of video instructions! Three premium slider are included with the theme! You get amazing Soliloquy slider, LayerSlider and Revolution Slider � worth extra $50 � for free! Great SEO base offers a huge advantage against other websites! Boost your SEO even more with a plugin. Theme offers a full integration with WordPress SEO by Yoast plugin including its SEO breadcrumbs and Google Authorship feature! Client access functionality is built right into this theme. Now you can give your clients dedicated login and display them only relevant content. Complete demo XML file is ready to be installed. All the instructions (even video one) can be found in theme�s user manual to make the theme ready for your tweaks. And it includes sliders, menus and widgets too! Custom contact page map design? No problem at all with !LesPaul. Yes, indeed, it is so easy to style even a map on your contact page. Automatic theme udpates via Envato WordPress Toolkit plugin. Extensive demo content with beatiful page layouts, demo images, sliders and contact forms included in the download package!